DONT STOP BELIEVING IN GRINTSON!!!!!!!!!!!!!!!!! 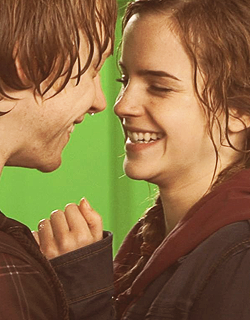 The revelation of a Rupert and Emma RomancE.... Priceless! DONT STOP BELIEVIN IN GRINTSON!!!!!!!!!!!!!! Haha. LOL I kind of think of being thrown in the brig as tough love. Not punishment. Plus it's not all bad really. I've made friends with a few furry creatures down there and sure, the creepy crawlies may not look the most appetizing, but when you're hungry, well, it all tastes like chicken anyway. Edited by Mr. Pumpkinhead, 10 July 2016 - 02:34 AM. DONT STOP BELIEVIN IN GRINTSON!!!!!!!!!!!!! My brothers and my sister have always had good senses of humor about things. I would say that when we get together we're not always funny, but we always have fun, we always laugh, and that's where I come up with the stuff I come up with. It's all just part and parcel to trying to be positive and have fun. Hopefully the things I say about Harry Potter and Rupert and Emma or Ron and Hermione are fun and positive more often then not. Sometimes I can roll my eyes at the things I write, but with all the seriousness in the world I feel like this place is a place where I can be genuine and honest, but I don't have to take myself too seriously either. I really hope the same thing for R/E. They need that privacy and down time. I wish the papparrazi and media would see that there are a whole bunch of celebrities out there that don't want this as part of their job. Have you ever seen Brad Paisley's video "When You're a Celebrity"? It truly is hysterical yet so much truth is in it too!! DONT STOP BELIEVING IN GRINTSON!!!!!!!!!!!!!!!! Best moments ever: the trio's speeches, R/E: holding onto each other so tight!!!!!! Love it!!!!!!! DONT STOP BELIEVING IN GRINTSON!!!!!!!!!!!!! OMG, the last premiere was 5 years ago already? From a videographer perspective it's one of the last things we R/E shippers have to hold on to regarding the ship which is part of why I think it will hold a special place in our hearts. There were several lovely Emma and Rupert moments during that final premiere. I have not seen Brad Paisley's video or heard the song yet, but I will be sure to check it out Kristin. I had the SAME EXACT REACTION!!!!!! 5 years?? Back y'all Denver was ever so lovely!!! Thrown right back into work (had less days to get classroom ready this year-County decision don't ask Lol-I can laugh now but was not laughing last week. gah i went MIA again lol. And I'm doing good jon, just working alot and now going back to school on top of that. ah you went to Denver cbmac12?? How was it? I was supposed to go last month but it didn't quite work out like me and my friend had hoped it would. Edited by 2 Pints, 04 October 2016 - 12:23 AM. Edited by pat07, 14 March 2017 - 05:00 AM.